Arunachal Pradesh Police today completed its three-day Train-the-Trainer program on body conditioning and strengthening exercises for police trainers in 1st AAP BN. Ground, Chimpu, Itanagar. Twenty master trainers from across the five battalions of Arunachal Pradesh Police were hand-picked to participate in the novel training programme from June 13 to June 15, which focused on indoor and outdoor endurance-building, circuit-training and restorative exercises and brought in a guest instructor from Delhi. This immersive training program was designed to boost police trainers’ understanding of the benefits of innovative exercise techniques to both physical and mental wellness. Using equipment and methods used to train national and Olympic level athletes, the program helped trainers learn new exercise regimes, ways to modulate exercises based on cognition of individual body types, correctly warm up/cool down to avoid injury and activate muscles in often overlooked parts of the body. The train-the-trainer programme is part of Arunachal Pradesh Police’s first ever state-wide ‘Celebrating Wellness’ month w.e.f. 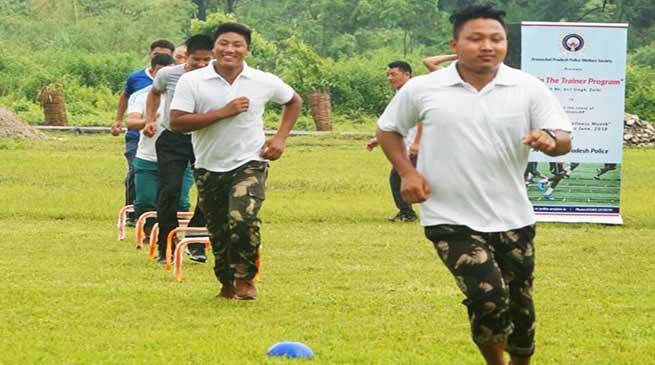 21 May – 21 June 2018 wherein yoga practice sessions, health check-up camps, plantation drives and body conditioning and strengthening exercise train-the-trainer sessions are being held for police officers of all ranks and their families across all 23 districts of Arunachal Pradesh. The month will culminate in an International Day of Yoga event held on June 21.